ALDS: Cleveland 3, New York 2; Baltimore 3, Seattle 1. After splitting the first two games in Baltimore, the Indians and the Orioles played a marathon Game 3 at Jacobs Field. Cleveland closer Jose Mesa blew a save with one out in the top of the ninth, when Brady Anderson connected for an RBI double, putting the Orioles on the board at last. The game went 12 innings, lasting nearly five hours. It was after midnight when Omar Vizquel tried to lay down a suicide squeeze with one out and men on the corners. Randy Myers delivered, Vizquel missed the ball (according to televised replays), and replacement catcher Lenny Webster was unable to hold onto it. Thinking it had been fouled, Webster nonchalantly retrieved the ball, and in the meantime, Marquis Grissom stole home -- ending the game and giving Cleveland a pivotal 2-1 series lead. That was the play of the 1997 ALCS. 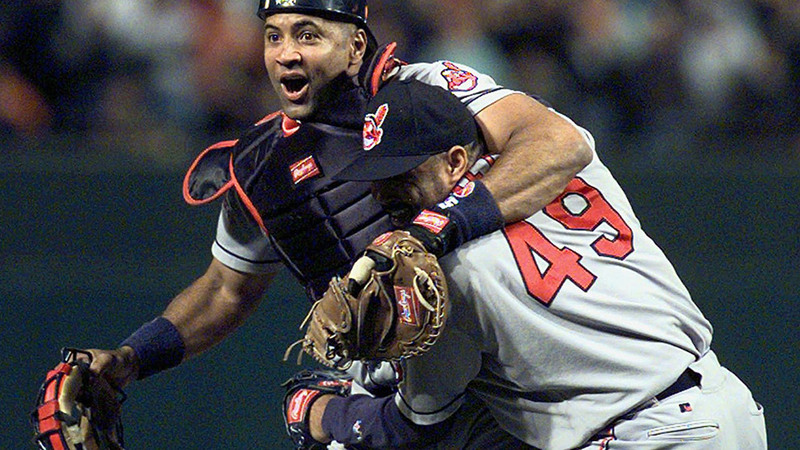 Sandy Alomar -- a hero in the Indians' previous series with a big home run off Yankees closer Mariano Rivera -- hit a walk-off single off Armando Benitez to give Cleveland an 8-7 victory the next night in Game 4. The Orioles were able to take Game 5 and send the series back to Baltimore, but that was it. Game 6 was a classic scoreless duel between Cleveland's Charles Nagy and Baltimore's Mike Mussina -- sealed on Tony Fernandez's solo homer in the top of the 11th off Benitez. Fernandez had been playing second because a ball he struck in batting practice had hit second baseman Bip Roberts, requiring him to replace Roberts in the lineup. Cleveland clinched when Roberto Alomar was rung up on a disputed called third strike, and it was worth noting that John Hirschbeck -- the home plate umpire Alomar had notoriously tangled with in the final days of the 1996 season -- was among this umpiring crew, manning third base. Cal Ripken Jr., whose record streak of consecutive games played was still active at 2,478, made his final postseason appearance in this series. Ripken went out strong, going 8-for-23 (.348) with a homer and four walks -- one of them in the bottom of the 10th in Game 6 for his final postseason at-bat. The Indians returned to the World Series for the second time in three years, this time against a Florida Marlins club that was bidding to become the first Wild Card to go all the way.